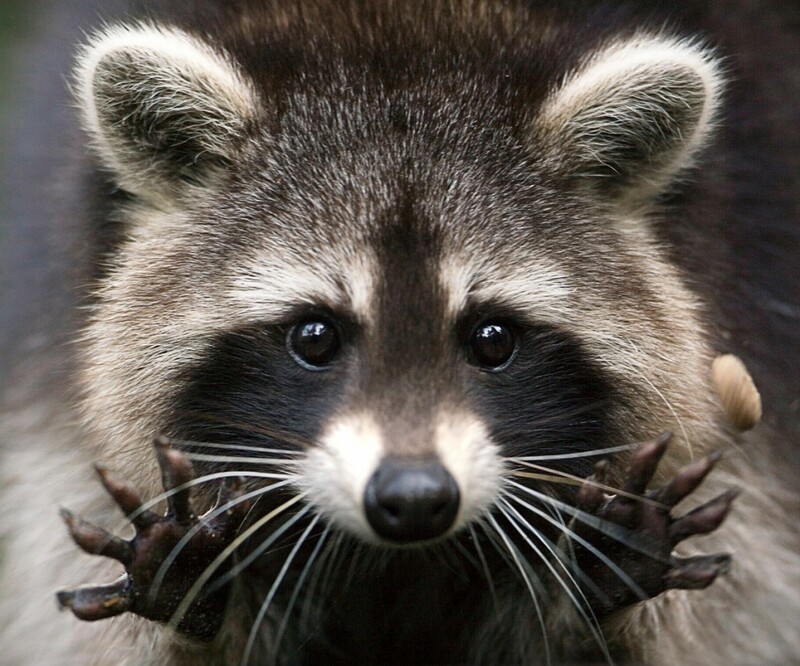 Raccoons are grey in colour with a black mask that covers their eyes. They have five to eight light to dark rings that alternate on their tail. Their back legs are longer than their front legs giving the hunched over appearance when they walk or run. They have five fingers on their front and back paws. They are a medium sized mammal and average between 24-38 inches and they can weigh between 14-30 pounds. They are mostly nocturnal. A normal raccoon will spend most of its time during a day or two within a 4-square km area. They are very good climbers. They prefer to stay out of sight, traveling in ditches, etc. They can fit through surprisingly small openings: 2½-inch x 4-inch. Raccoons are Omnivores, which means they eat meat, fruits and vegetables. They are opportunistic eaters and will eat anything they can get their hands on. Their diet might include fruits, plants, nuts, berries, insects, rodents, frogs, eggs, and crayfish. City raccoons are known for disturbing dumpsters and garbage cans; they will eat bird food and or your pet’s dinner if it is accessible. They are easily adaptable to new environments, which is why they thrive in our cities. A raccoon litter is usually born in April-May (2-6 kits) and weaned by fall (about 3 months of age). The mother raccoon will usually have 2-3 den sites. This means that if the primary den site is a problem, persuading the family to leave is rather easy since they have a back-up den. Raccoons generally become inactive by late October, only re-emerging for the mating season. However, they are not considered hibernators. There are several preventative measures you can take to keep raccoons out of your area of residence. Keep garbage in a very secure container preferable inside the garage. Don’t put garage out to the curb until the morning of pick up. Eliminate potential denning areas and access points. Keep bird feed cleaned up daily and take feeders inside at night. Preventative measures will help you to keep Raccoons off your residence, but if you already have an unwanted guest on your property, let us get rid of them for you in the most humane way possible.